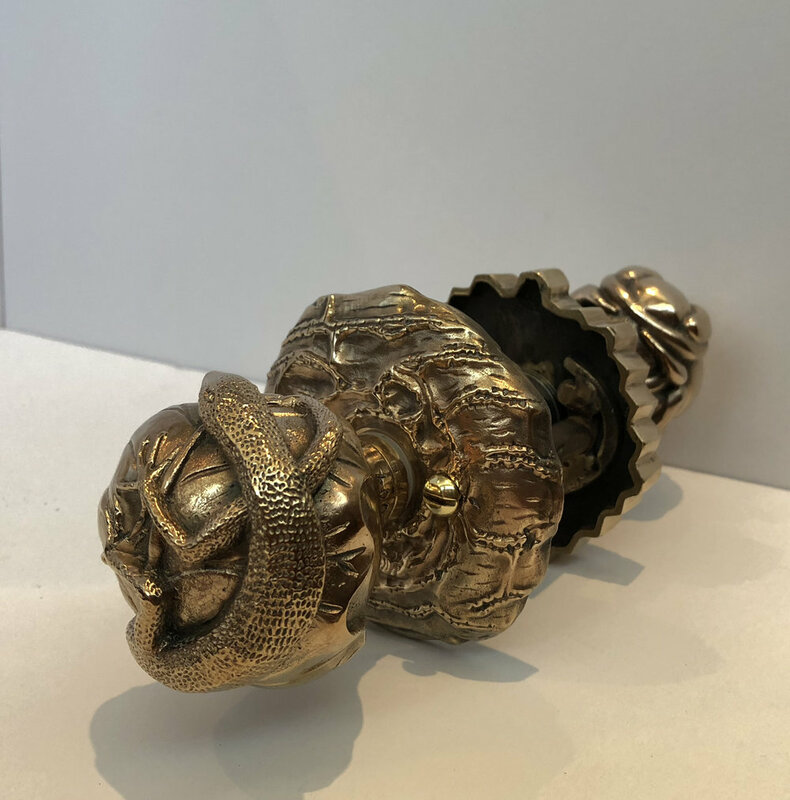 The nature inspired Netsuke door handle collection was not conceived as an interchangeable series, but thankfully creative interior designers have conjured up imaginative ways to use these as combination door handle sets. Case in point is a recent project where the bee door knob was paired with the lizard door knob to create a whimsical statement. The sets were specified in polished bronze to create a stunning jewel like set for a custom makeover of the master bedroom and bathroom. The bathroom privacy set used a simple push-pin latch on the honey comb side with a discreet emergency release on the bark rose side of the door (exterior). Our door handle knob sets are connected with a square 8mm spindle that is attached to each knob with a set screw or Allen screw. As we use the same type of spindle for all our door knobs most of the knobs are interchangeable. Since other door hardware manufactures use different spindles and methods of attachment our knobs may not be suited as half sets with knobs supplied by others. The Netsuke collection comprises 4 interchangeable animal knobs including a rabbit, frog, bee and lizard making them popular choices for children’s bedrooms. While whimsical in nature, these animal knobs are finely detailed and cast in solid bronze with each knob using a lb. of molten bronze. As a transitional set that bridges the classical with whimsical you may want to consider the Hedgerow and Willow knob on the more public exterior side of your door with a Netsuke knob on the more private interior side.